The Undergraduate Student Government Elections Committee held three hearings Thursday and Friday regarding the Elections Code, including allegedly voting on behalf of another student, posting campaign materials on sidewalks and lamp posts and not including official USG logos on their campaign materials. 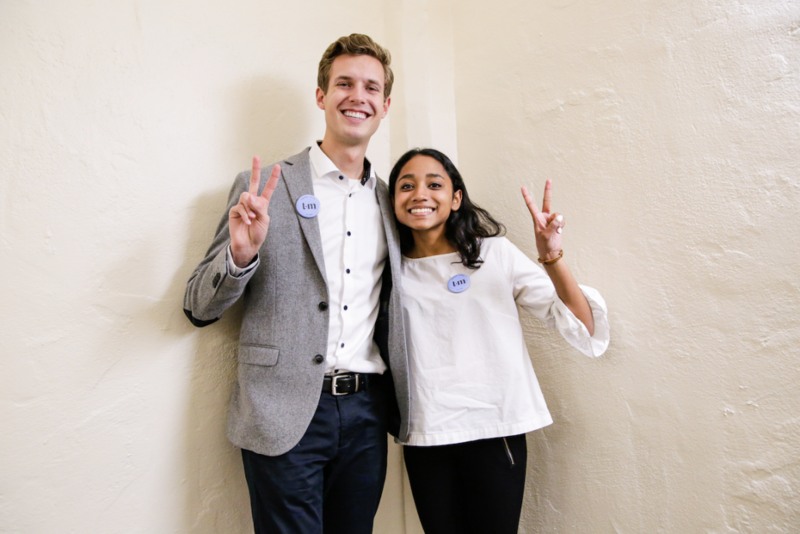 The committee gathered Friday after a canvasser for presidential candidate Trenton Stone and vice presidential candidate Mahin Tahsin allegedly took a student’s phone and voted on their behalf. The Elections Commission unanimously voted against the complaint, stating that a violation of the Elections Code had not occured. “All of the 32 canvassers … have sent me a text saying sometimes [they’d] interact but had never hit submit,” Stone said at the meeting. According to Stone, canvassers handed out flyers with a QR code that linked students to the election voting page, which often required assistance from the canvassers themselves. Murphy took three photos of the interaction between the canvasser and the students, which were presented in the hearing. Murphy said she wanted to speak up about the alleged incident in case one of Stone and Tahsin’s canvassers didn’t understand USG’s rules. The committee also held a hearing Thursday after a complaint was filed against presidential candidate Maxwell Brandon and vice presidential candidate Grayson Adler’s for posting campaign material on a lamp and for not including the USG logo on their campaign materials. The policy requires that all visual campaign materials contain an unedited USG logo. Candidates are also prohibited from posting campaign material on University Housing facilities, in addition to lamp posts, trees, hedges, trash cans and parking structures, according to the Elections Code. The committee unanimously voted that the campaign violated the election code and sentenced the Brandon-Adler campaign with a one day deduction of digital campaigning. On Thursday, the committee also held a hearing for a complaint filed against senatorial candidate Quinn Cunniff whose campaign included materials that were taped to the ground. The policy states campaign materials cannot be taped to or covering the ground. The committee also unanimously decided that Cunniff violated the election code. He was similarly sentenced with a one day deduction of digital campaigning. No students could be reached for comment because election policy prevents any USG member or anyone affiliated with a campaign from speaking to the press regarding a hearing. The post Three USG campaigns face hearings appeared first on Daily Trojan.